Not only are these extremely easy to execute but they are also wildly delicious. This recipe has a lot of different flavors that range from bold to simple. They all work really well together. 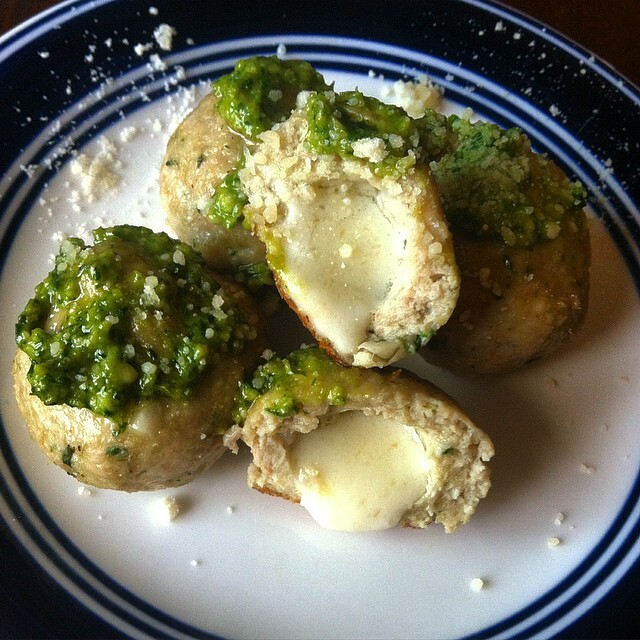 The pesto is very fresh and robust, whereas the gooey mozzarella adds an amazing creaminess. The chicken meatball “shell” ties it all together with crunchy garlic bits and a bread-y base. I wouldn’t recommend serving these with anything too heavy because they are really the star of the show. I served them with steamed vegetables and found them to be the perfect “supporting actors.” By some miracle, we did not eat all of these in one night and were able to get two dinners out of them. They reheat really nicely. This will be a repeat recipe and I can’t wait to get creative with what we serve alongside them. Mozzarella is a pretty melt-y cheese so if you are using shredded cheese mold the cheese into about 20 small/medium balls. If you’re using a block of mozzarella, cube about 1/4 of the block and roll into 20 small/medium ball shapes. Put these into the refrigerator while you mix up the meatball ingredients. This shouldn’t be too difficult as the warmth of your hands should make the cheese pliable enough. Mix together the ground chicken, panko, egg, garlic, salt, pepper, and 2-3 tbsp of the pesto. Form a small/medium sized meatball and press one mozzarella ball into the center. Roll the filled meatball in your hands to make sure the mozzarella is completely covered by the chicken mixture. If you don’t do this well enough the mozzarella will just ooze out in the oven. Repeat until meatball mixture is all used up. Bake for 13 minutes, or until the meatballs are fully cooked. With Football season upon us I think it is appropriate that I post a “game day buffalo chicken something” recipe. This is a great dish for game day because it doesn’t require a lot of fuss and will feed all your footballers. 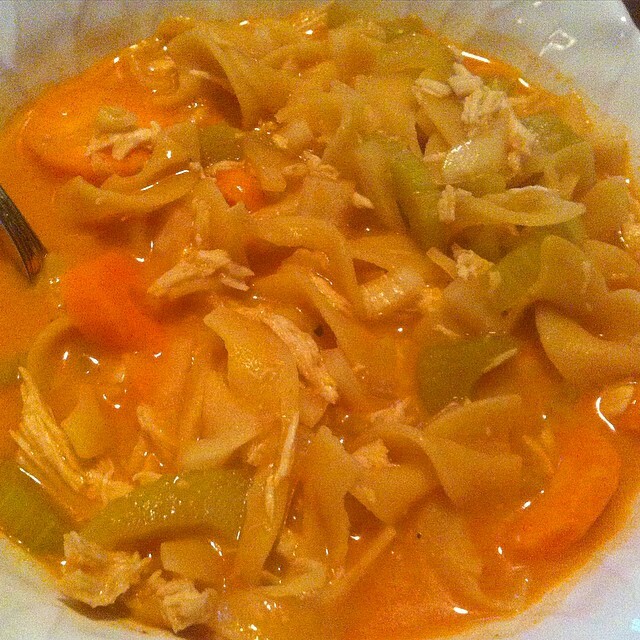 Be warned, that with everything else buffalo chicken, this soup is ADDICTING! It has a great spicy bite with tender shredded chicken and fill-your-belly veggies/egg noodles. This soup is so easy to throw together and such a pleasure to enjoy with family and friends! 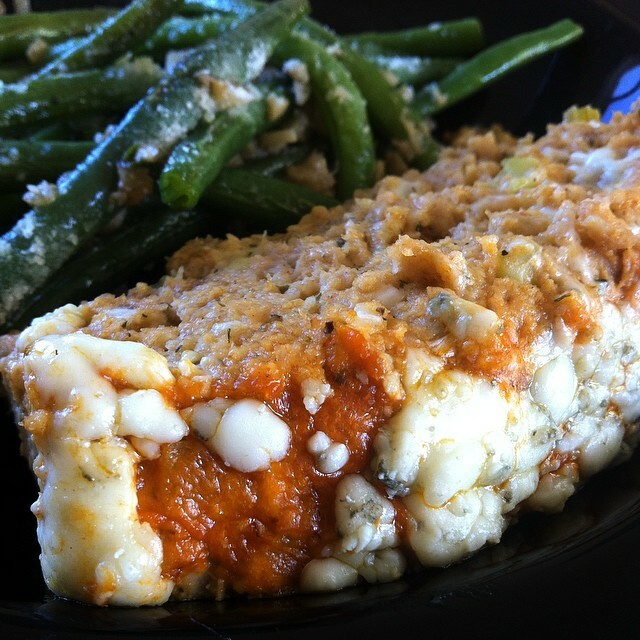 We love this recipe and cannot wait to make it again! Add carrots, celery, garlic, onion, chicken, buffalo sauce, and chicken broth to the crock pot. Cook on low for 3 1/2 hours. Add the egg noodles, raise the temperature to high, and cook for a half hour. Turn off the crock pot and stir in the heavy cream.